Thermistors are simple, inexpensive, and accurate components that make it easy to get temperature data for your projects. Remote weather stations, home automation systems, and equipment control and protection circuits are some applications where thermistors would be ideal. They’re analog sensors, so the code is relatively simple compared to digital temperature sensors that require special libraries and lots of code. In this article, I’ll explain how thermistors work, then I’ll show you how to set up a basic thermistor circuit with an Arduino that will output temperature readings to the serial monitor or to an LCD. Thermistors are variable resistors that change their resistance with temperature. They are classified by the way their resistance responds to temperature changes. In Negative Temperature Coefficient (NTC) thermistors, resistance decreases with an increase in temperature. In Positive Temperature Coefficient (PTC) thermistors, resistance increases with an increase in temperature. 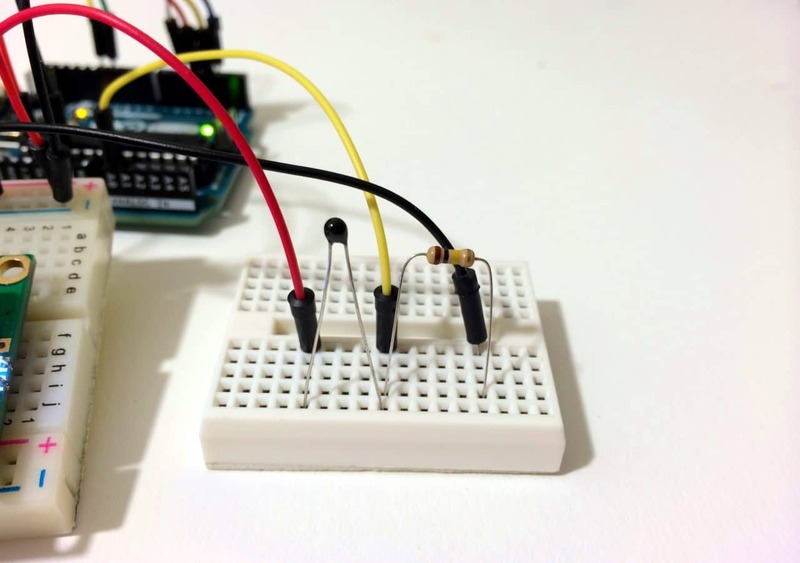 NTC thermistors are the most common, and that’s the type we’ll be using in this tutorial. NTC thermistors are made from a semiconducting material (such as a metal oxide or ceramic) that’s been heated and compressed to form a temperature sensitive conducting material. The conducting material contains charge carriers that allow current to flow through it. High temperatures cause the semiconducting material to release more charge carriers. In NTC thermistors made from ferric oxide, electrons are the charge carriers. In nickel oxide NTC thermistors, the charge carriers are electron holes. Let’s build a basic thermistor circuit to see how it works, so you can apply it to other projects later. Since the thermistor is a variable resistor, we’ll need to measure the resistance before we can calculate the temperature. 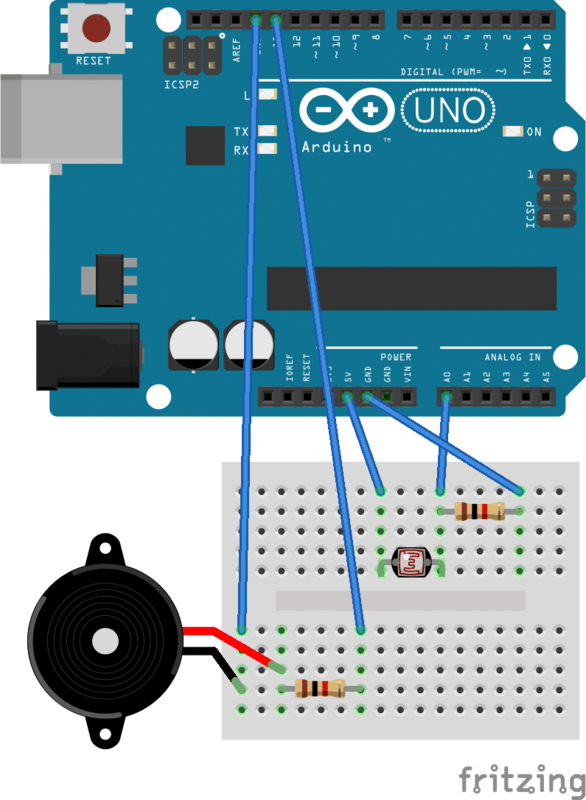 However, the Arduino can’t measure resistance directly, it can only measure voltage. Finally, the Steinhart-Hart equation is used to convert the resistance of the thermistor to a temperature reading. The value of the resistor should be roughly equal to the resistance of your thermistor. In this case, the resistance of my thermistor is 100K Ohms, so my resistor is also 100K Ohms. The manufacturer of the thermistor might tell you it’s resistance, but if not, you can use a multimeter to find out. 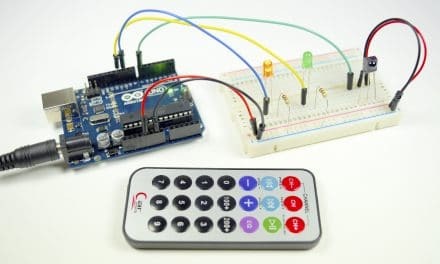 If you don’t have a multimeter, you can make an Ohm meter with your Arduino by following our Arduino Ohm Meter tutorial. You only need to know the magnitude of your thermistor. For example, if your thermistor resistance is 34,000 Ohms, it is a 10K thermistor. If it’s 340,000 Ohms, it’s a 100K thermsitor. To display the temperature in degrees Celsius, just comment out line 18 by inserting two forward slashes (“//”) at the beginning of the line. Well, that’s about it. Just leave a comment below if you have any questions about this project. And if you like our articles here at Circuit Basics, subscribe and we’ll let you know when we publish new articles. Also, feel free to share this if you know anyone that would find it helpful! Is connecting wires mean arduino 40 pin female to female jumper connector? I’ve seen your Videos on Youtube and came to your website. Great! I tried to do make the circuit with the Thermistor (81210W26)and had a strange problem. Have you got an Idea where I have to search for the problem? I couldn’t find any information on your specific thermistor, but it sounds like the problem could be related to if your thermistor is PTC (positive temperature coefficient) or NTC (negative temperature coefficient). The thermistor I used in this article is a NTC thermistor, so if you have a PTC thermistor, it could cause the temperature changes to become opposite from what you would expect. I don’t have a PTC thermsitor to experiment with, so I’m not sure what the code would look like for a PTC thermistor. Hello to everyone, a little help please? 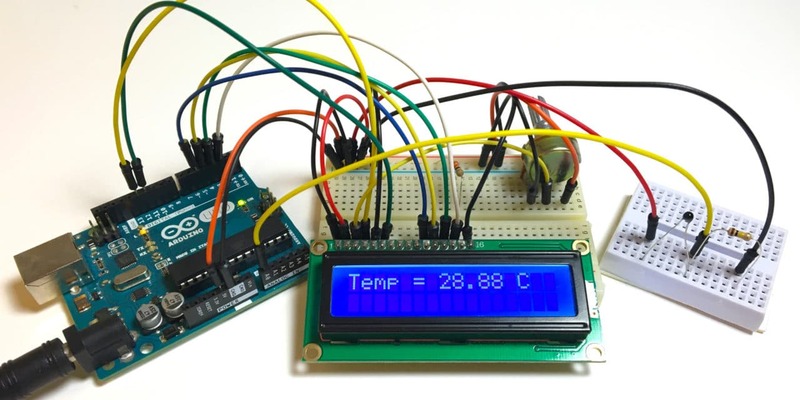 I want to build a thermistor temp sensor using arduino (as in above circuit) but then need to convert measured temperature in degrees centigrade to air flow in meters per second, and be able to display on screen, and record this via computer. Any help suggestions greatly appreciated. Perhaps a bit late, but I experienced the same problem. I reversed the + and – leads and this solved it, leaving the center lead the same. Not sure what that had to do with anything, but it worked for me. i need a heat temperature sensor but it is very expensive. i’m working on a project and i need to heat a metal up to 150 degrees to test it on my machine cooler project. Is this thermistor temperature sensor can measure up to 150 degrees? I am looking forward to your response. Thank you very much. I tried the project with the LCD. The value read is double than the real value in the room. So on line 10 for LCD I did : ” Temp = (Temp – 273.15)/2; ” and I had the normal value that was supposed to be. Probably I will have to study this equation. Or maybe there is something else? You might try to check the value of the resistor you are using!bc i was using a 220 ohm resistor. And by changing the “R” value you will get the correct readings without changing the calculation part of the program. Hello, I math.h download? Where can I download it? Eventhough im using math.h headefile in my test file im getting the error. what is the solution for this problem. Im using the same concept for other controller. The code is littile bit different accroding to the controller but it showing error at reading log function from math.h. I rectified that error. Now my problem is as im increasing the temperature the value which is showing on the LCD is decreasing im not getting why this is happening. Here i am using NTC (negative temperature coefficient) thermistor p103. Can any one tell me how to rectify this problem. it works brilliantly but could you suggest me how to put 2 thermistors that give 2 readings simultaneously in Celsius? could you suggest me how to put 3 thermistors that give 3 readings simultaneously in Celsius?.. im trying to connect from 2 weeks but im not able to.please help me. First it’s not “RawADC-1” but rather (1024.0/RawADC)-1 since the multiplication takes precedence over the subtraction. Actually it should really be 1023 instead of 1024 since you can only read from 0 to 1023 from the port. Or if you prefer it’s (1023.0-RawADC)/RawADC which can directly be deducted from wiring the NTC to the 5V and R1 to the GND. R2 = R1 * RawADC / (1023.0 – RawADC) however, in this case you might want to use 1024 to avoid dividing by zero if your NTC opens up or get disconnected. didnt understand line 5 and 6.can anyone explain whats going on there? hi, I am using a 100k glass bead thermistor (meant for 3d printing), and wired it up like you showed and uploaded the code. when i visit the serial monitor the temperature given there is negative and makes no sense whatsoever . Please tell me what is happening. hi , can this sensor mesure temperature for health ??? Thanks a million for the video and sketch. I am building a temp sensor for our local paranormal group (no I am not into ghosts, but my niece is, so this is for her.) So what I need to do, is store the initial temp in a variable, then check the subsequent temps against that temp, and besides reporting the temp, report on the next line weather temps rise or fall, as well as light a red LED if the temp rises, a blue LED if it falls, and a green LED if it remains the same. Should be easy to set this up by editing your sketch, I think, oh and a main switch to turn this unit off and on, as well as hooking up say a 9v battery for power to the unit, again simple, but as I go on, it seems to be more and more complicated. Sketch uses 4,176 bytes (12%) of program storage space. Maximum is 32,256 bytes. Global variables use 222 bytes (10%) of dynamic memory, leaving 1,826 bytes for local variables. Maximum is 2,048 bytes. I want to know which is the maximum operating temperature resistors and capacitors for Arduino uno? To add more thermistors keep adding the following code and change the analogue read pin. Note that you cannot connect your aditional thermistors to the same voltage supply unless you change the mathematical equation as you will change the resistance of the circuit each time you add a thermistor. In your video you have used 100k ohm resistor with thermister but in the other part of the video you have used two other resistors with 16×2 lcd !! So my problem is that you have not declare the resistor’s quality and its number in the start of video !! so plz mention the type of these two resistors quickly because it is my project THANKYOU !! Great tutorial. I wonder if it is possible to use a potmeter instead of a thermistor, so I could simulate the temperatures ? Please tell me: why this code can not compile with Energia? Finally, a good quality video, and no BS waste of time, on Arduino setup and programming. Thanks! Hello I do not have the data sheet of my thermistor how to dO MY PROGRAM? The thermistor used in this article is mainly used for sensing environmental temperatures. It could be used for human body temperatures, but it depends on how you want to measure the body temperature. Since the human skin acts as a thermal insulator, the temperature of the skin isn’t an accurate representation of actual body temperature. That’s why most body temperatures are taken with an oral thermometer. The problem with using this thermistor orally is that the exposed leads of the thermistor would be partially shorted by the saliva in the mouth. But that said, I have seen some thermistors that have the leads insulated with plastic so those could be used in aqueous environments. Also, you could use this thermistor to take body temperature from the armpit, which is pretty close to the actual body temperature. Hope that helps! I have just made it and is working very well and very fast. Now i will try to put together with a lcd keypad shield nad a relay and make a thermostat. change the thermometer value with the shield buttons . So if i want to make any changes i will not need the use of a pc or laptop. Than you for all tutorials. ¿Se puede cambiar ese termistor por un RTD de platino (WZP – PT100) de 100ohms? Most excellent tutorial. Exactly what I needed to complete my project to read temperature and display on a little OLED display. What if I want to use more than one thermistor to sense different temperatures, say 10. How will the schematic and code change? Any ideas for the new circuit? And if you want to connect more than one sensor, what code you will need to write? R1=10000 in your example. is not wrong because you are used 100k resistor? if you use 100k resistor R1 must be = 100000? We want to have a continuous record of body temperature instead of room temperature. 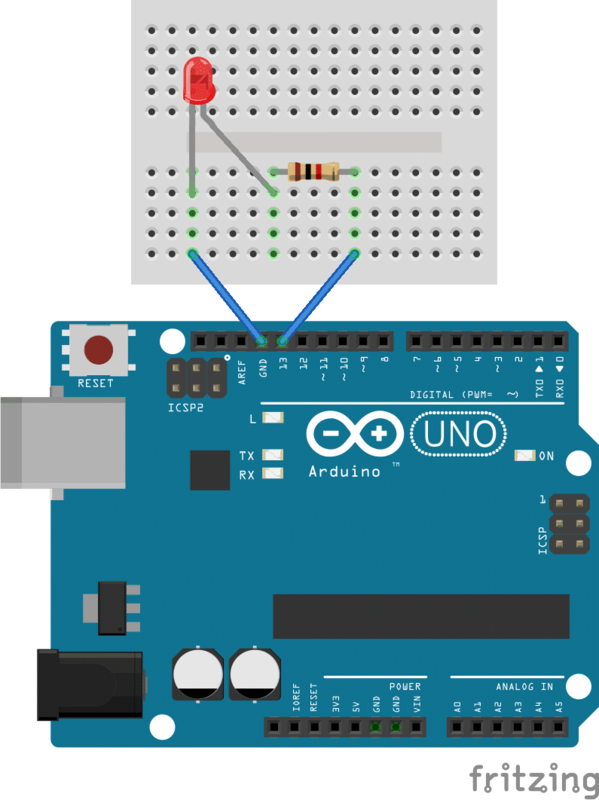 Which thermistor should we use and how to connect it with arduino? how did u write 10k instead of 100k? I followed the above steps exactly, however the numbers I get are negative 459 Fahrenheit and does not change at all. the only difference in the parts used is the thermistor. I believe its resistance is 24000 ohms and my resistor is 10kohms. I’d like to find coefficients for it. Would they be the same? Do you have an updated link? Hi, how do you connect a capacitor to the circuit above ? Will this make the thermistor more stable? The rearranged formula for R2 seems to be incorrect. I believe the X (multiplication) should be a / (division). Actually the rearranged formula works fine assuming R2 is the thermistor. My confusion was caused by the misalignment of the voltage divider formula, which measures voltage across R2, and the rearranged formula, which measures voltage across R1. Algebraicly you can’t rearrange the 1st formula to get the 2nd. I think that if Vout = Vin* R2/(R1 + R2), then R2 = R1 * Vout / (Vin – Vout), not R2 = R1 * (Vin/Vout – 1) as indicated above. Had me confused for a while, but then I realised that R1 = R2 (Vin/Vout – 1). However, R1 is not the unknown. If we make R1 the unknown, then we end up with R1 = R2 * Vout / (Vin – Vout). I may actually build a circuit to see if this works. Thanks. There is only one problem with this circuit. Recommended max impedance for the atmega 328 analog inputs is 10K. The circuit will work fine if using only one analog input, but the adc readings will not be stable if using another analog input. Can you please elaborate? I don’t understand why there is a max impedance on the analog inputs. Shouldn’t they read any voltage value as it is? I was planning on using A0, A1, A2, and A3 for 4 different temperature sensors. Hi. I’m working on a project where I have to avoid a certain temperature range. The range I’m avoiding is from 5 degree Celcius to 60 degree Celcius. What I really want is to add a condition that would display the words “Danger Zone” when the temperature is anywhere in between the said range. I was thinking along the lines of adding an if else statement with the following. I built the circuit as well and get the same result (-459.67 deg F). Were you able to determine what the problem is? How do you setup a chain of thermistors? 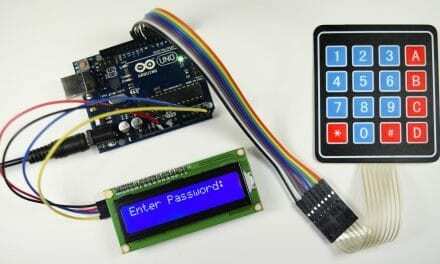 Arduino has a limited numbar or ports. hello, how much did this project cost you? How can I get rid of the decimal so the LCD only displays a whole number like 76 F instead of 76.12 F? I’ve got a 10K thermistor and 10K resistor hooked up, I am getting values but, for example, when I hold the thermistor the temp goes up but it goes slowly and maxes out at 83ish F. Do I need to change something because of my 10K components? Your R1 value in sketch reads 10000, shouldn’t it be 100000 for a 100k resistor or am I missing something? Hi! can i replace the thermistor with a peltier module? hi my problem is that comes up with -999.00 for my temperature reading.How do you fix this? Is this method able to measure negative temperatures (like below 0 deg C), I failed to measure negative temperatures using LM35 and DHT 11. I am having an issue with my thermistor outputting Fahrenheit as 198.73 at room temp… I cannot seem to figure out what the issue is but it is calculating F to C correctly. The values are just way too high. The conversion from centigrade to F might be more readable if it were written F = C * (9/5) + 32. Maybe, I’m OCD about math.